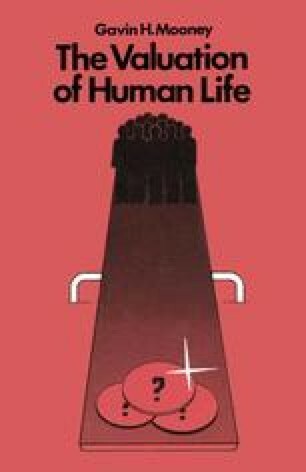 It is perhaps worth emphasising at the beginning of this chapter that there is no apparent readily available ideal solution to the problem of valuation of human life. There are grounds for believing however, as previous chapters have already indicated, that some (but not all) of those efforts which have been made in the past to value life have been somewhat misconceived. This has increased the difficulties in attempting to take economics into this field and to use it to improve decision-making in life-saving activities. There is no single method which will immediately allow benefits of reductions in mortality to be measured in a wholly satisfactory way. None the less it is possible to outline the type of approach which is likely to lead us along the right path—even although we must for the moment consider the approach principally from a conceptual and theoretical point of view and record some doubts as to its applicability in practice. While this is not wholly satisfactory, it does mean that we can at least narrow the field of possible methods to the one which appears most likely to be acceptable.